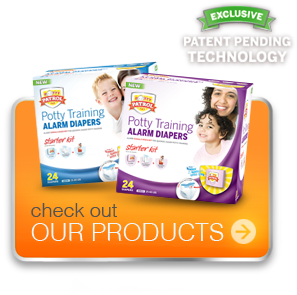 Potty Patrol's Potty Training Alarm Diapers are designed to notify you and your child when wetting occurs, so that you can place your child on the toilet immediately. Being placed on the toilet while the event is still fresh in your child’s mind helps them make the connection between cause and effect more quickly and effectively. Wondering how to potty train your child with less hassle? Potty Patrol reduces the need for random sits on the potty during toilet training! Many children interpret this as punishment, because they don’t understand why they are confined to the potty for extended periods of time. Worse yet, if they don’t need to go to the bathroom at that time, they may feel they have failed, because they are unable to meet their parents’ expectations.Potty Patrol encourages success, because it ensures that children go to the bathroom for one purpose…to use it!